Are you the list maker, the organized person who actually thrives by taking on big projects? Do people seem to come to you when they need help pulling a project together efficiently? If you answered yes to both of these questions, then maybe a Bachelor's degree in project management is the perfect educational path for you! Generally speaking, individuals with a degree in this field have intentions of working within the business world. This four year course of study is typically an area of concentration that is contained within a college or university's business administration degree program. Keep in mind, a degree may only allow you to get entry level positions in this career. However, furthering your educational level can easily open up additional job opportunities. A Bachelor's degree in project management is typically offered by traditional brick and mortar colleges, as well as online learning institutions. You will want to choose the learning format that best fits your schedule, your location, and your learning style. Also, many campus based colleges or universities offer some courses within a degree program online and some that must be completed on campus. As long as you choose a post-secondary learning institution that is accredited, you can elect the remaining options based on you and your life outside of school. Before you will be admitted into a project management degree program you must have your high school diploma (or the equivalent), a copy of your high school transcript, a minimum GPA requirement, and letters of recommendation. As you begin working towards your Bachelor's degree, you will be developing a foundation in finance and business. As you get further towards your senior level classes, you will be learning techniques that are specific to project management and at this point you can begin focusing your studies on one particular area. For instance, you may choose to specialize in marketing, accounting, entrepreneurship, or finance. Depending on the school you are attending you may be required to complete a project before you will be eligible for graduation. In most cases, this project will allow you to showcase your skills and knowledge in a real world scenario. Sample courses that you will most likely be required to complete are: marketing foundations, time management and scheduling, technical solutions for businesses, management of project quality, internal communication, strategic management, and human resources management. On a daily basis as a project manager you will be expected to identify the scope of a project, set the goals for a project, create an appropriate plan for the project, monitor the progress of the project, and close the project. While this may not sound extremely involved, it definitely is! It will be your responsibility to handle the scheduling, the consulting with executives and workers, the budgeting, and all direct business operations. You will most likely also have to delegate responsibilities accordingly and be a leader in all aspects of a project. Every company will have their own opinion of what they would call a good project manager. During your Bachelor’s degree training you’ll learn how to properly schedule projects and keep them on track. 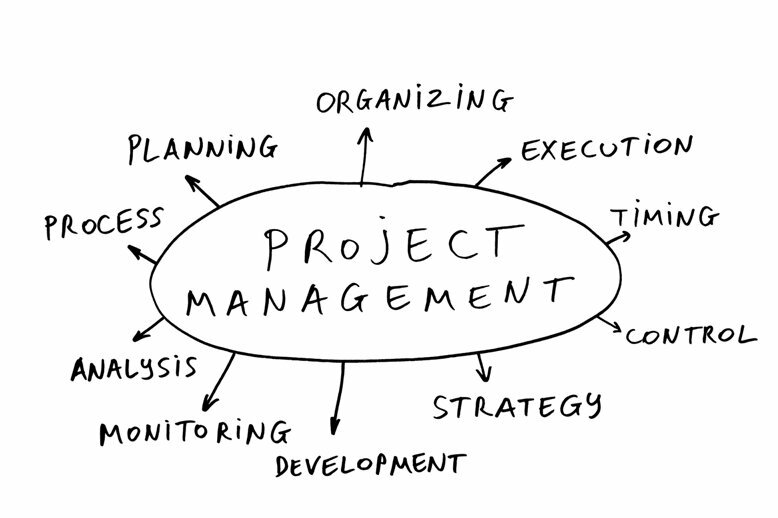 Project management usually involves collaborating with other departments and good communication skills. Leadership – Employees want a purpose to follow someone and as a project manager you’ll be leading a team or project to implementation. Adaptive – Project managers are very adaptive and are always changing plans based on the results they are seeing. Good Listener – Since you will be working usually on a team you’ll need good listening skills to be successful in project management. Asks the Right Questions – Besides being a good listener, project managers must also have the ability to ask the right questions and be prepared regardless of the outcomes. Takes Responsibility – As a manager you need the skills to lead a team and with that comes the responsibility for being the one responsible if something goes wrong. Great manager take responsibility for their teams failures but let the team take credit for all the success. One thing for sure is that you’ll never have a typical day as a project manager. Your day starts out with going over the scheduling for the project you are working on. This involves reviewing previous tasks that were assigned to other individuals or team. As a project manager lead probably the biggest most single task you’ll do is have meeting. In these meetings you have the ability to not only follow up with the progress of the projects you are working for but delegate out new tasks. -	Don’t fall into the trap of spending all of your time answering emails. The best communication you can have with your team is face-to-face. -	Take your time building the right team for the project. A good project manager knows the strength of their team. -	Flexibility – Good project managers have the ability to change up the project and timelines based on results and resources they have. Learn to be flexible when dealing with projects.